Want to avail cheap flights for the first quarter of 2018? Check this latest sale tickets as low as P599 for January, February and until March 15, 2018 trips! Grab promo tickets to many local and international destinations on this seat sale. Low fares are available for booking until August 21 or until sale seats lat. Fly to Boracay, from Cagayan De Oro and Cebu for only P599 or from Clark for as low as P799. 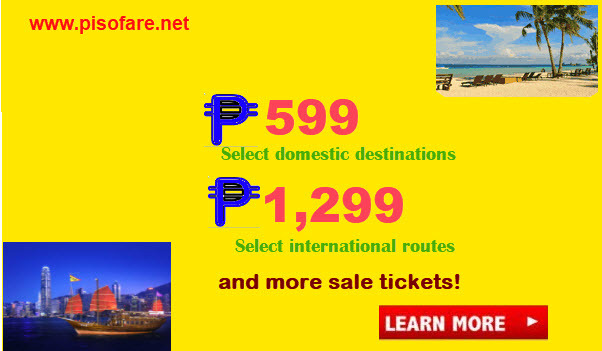 Various routes from Cebu, Cagayan and Kalibo can be also avail for P799. Trips from Manila to local destinations cost as low as P1,099 and P1,299 per way. Refer to your travel bucket list. 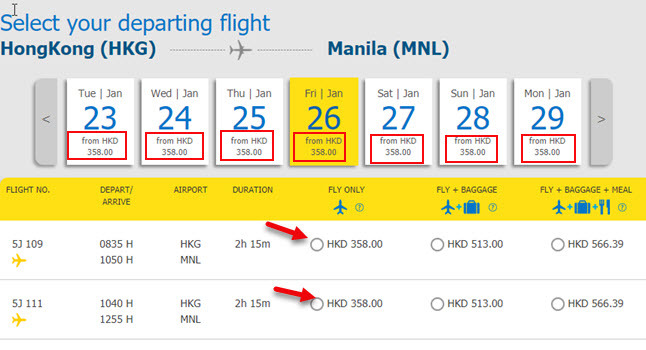 Many international places are included in the Cebu Pacific seat sale. 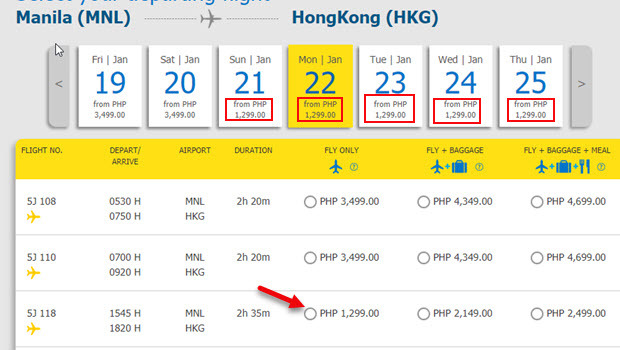 Flights to Hong Kong from Manila or Clark cost only P1, 299. Likewise, international flight from Zamboanga to Sandakan cost the same. Here is the 2018 List of Holidays and Long Weekends to help you plan your travel dates. Book tickets fast, LIMITED promo fares on sale! Check below ticket booking samples we got via online booking. Make up your mind now which destination you will book first. Quoted Cebu Pacific sale tickets are valid for one-way trip. Ticket inclusions: base fare, Web Admin Fee, taxes & fees and 7 kilos hand carry bag. 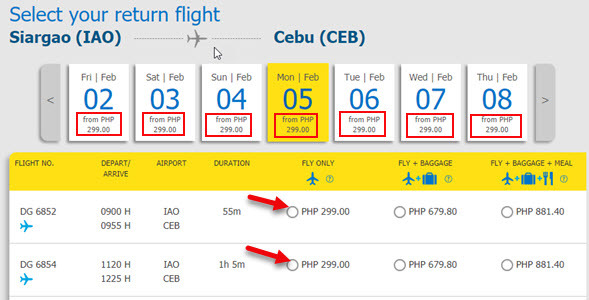 Promo fares of CebGo can be availed by booking online at www.cebupacificair.com. Go online at their website, select your airport of origin and destination, flight departure and return dates (if booking for round trip), number of passengers and find flights. Read this ONLINE BOOKING GUIDE if you need a guide in booking. Promo code is not required on this seat sale. Buying the cheap tickets at Cebu Pacific Sales and Ticket Offices in Metro Manila, Luzon, Visayas, and Mindanao can also be done. You may also purchase the sale seats at accredited travel agents and booking offices. Another way of reserving the low fares is by calling Cebu Pacific hotline at phone numbers: (02) 702 0888 (Manila) or (032) 230 8888 (Cebu) and book the fares with their CSRs. Your booked tickets can be paid via credit card or debit card. Pay within 24 hours from time of booking via these Payment Centers: 7-Eleven, LBC, EC Pay, Bayad center, Robinson’s Department Store, SM Department Store or Cebuana Lhuillier. Promo fares have limited availability, non-refundable but can be re-booked subject to fees. However, he re-booking fee is waived when you re-book or change your flight details within 24 hours from time of ticket purchase. Book or buy the Cebu Pacific promo fares now and enjoy your vacation from January until March 15, 2018! For more promo fare announcement for 2017, seat sale 2018 of Cebu Pacific Air, Philippine Airlines, Air Asia and other airlines, LIKE and FOLLOW our Facebook: PISO FARE TICKET!! !